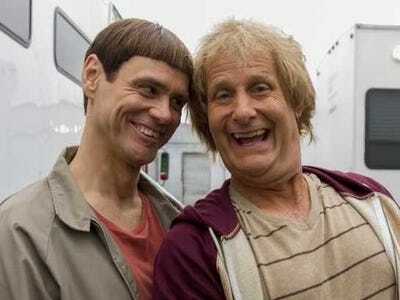 Poor reviews didn’t mean anything for the “Dumb and Dumber” sequel. “Dumb and Dumber To,” which reunited original stars Jim Carrey and Jeff Daniels 20 years later after the 1994 hit, made an estimated $US38 million worldwide. The Universal movie’s budget was a reported $US35 million, according to Deadline. The original film made over $US247 million worldwide after its theatrical run. Disney’s “Big Hero 6” came close to taking the top spot at the box office again. The animated picture made $US36 million in its second weekend. The film has now made over $US148 million in theatres. Christopher Nolan’s “Interstellar” rounded out the top three with $US29 million in week two . The sci-fi thriller is a big hit overseas. “Interstellar” has already made $US321 million worldwide.